A new craft business designing and making handmade, personalised gifts and homewares, from a small corner of Gloucestershire, UK. Welcome to my little corner of the blogosphere to share the ups and downs of starting a craft business, with plenty of tips, mishaps and the odd glass of wine! Gulp. It's been a while. I didn't mean to take such a long break from blogging, but as with all of us, sometimes life just gets in the way. So, I'm posting this as part of another brainchild by Trixi Symonds of Coloured Buttons the fab idea - Sew a Softie for Christmas. There'll be a host of wonderful bloggers taking part and I'll have another post written up later with all their details. The idea is that each tutorial is something that you can make at home, preferably simple enough to make with your children. 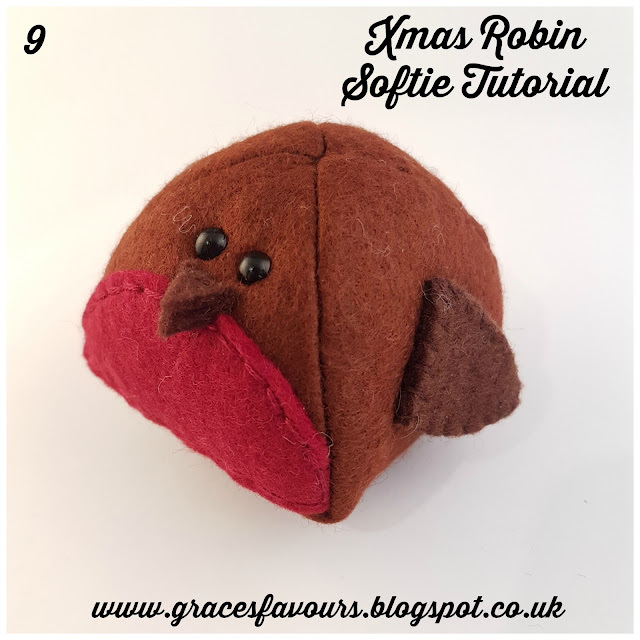 I love these little guys and after doing my trial run, I had a go at making one with Seren, my 8 year old. She was off sick last week, which gave us the ideal time to sit down, without any interruptions and get going. 1. Draw around the large pattern piece onto your mid brown felt with a biro (a pencil probably won't show up on the brown felt) You can pin the pattern to the felt, but little hands found it hard to keep the pattern piece in place as it was too large. 3. 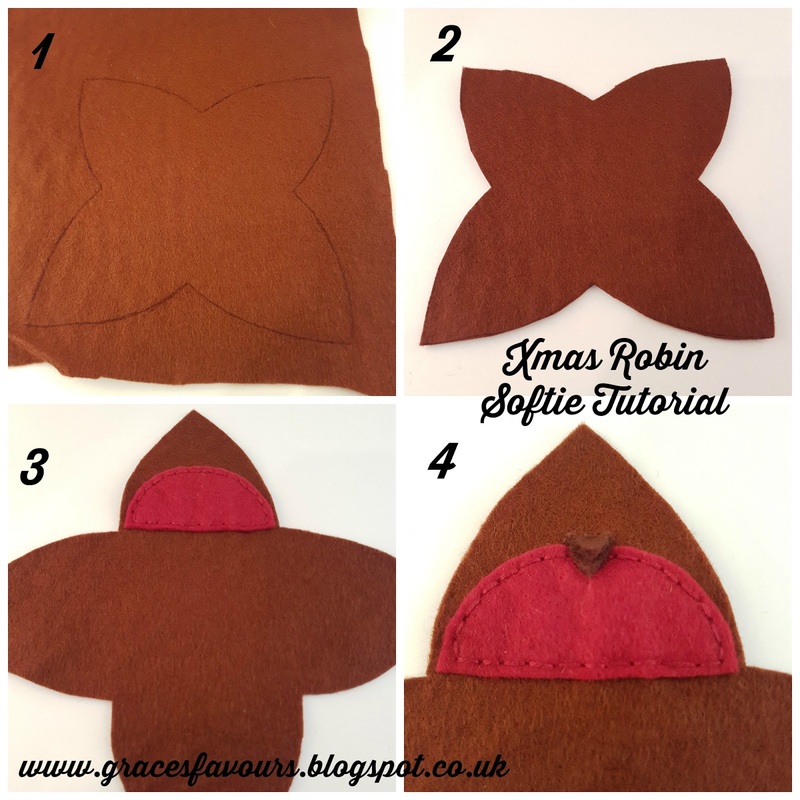 Cut out the red breast and stitch it to the brown felt as shown in the picture. Use 2 strands of red thread to match your felt and back stitch in place. 4. Cut out the small diamond shape from the dark brown felt. 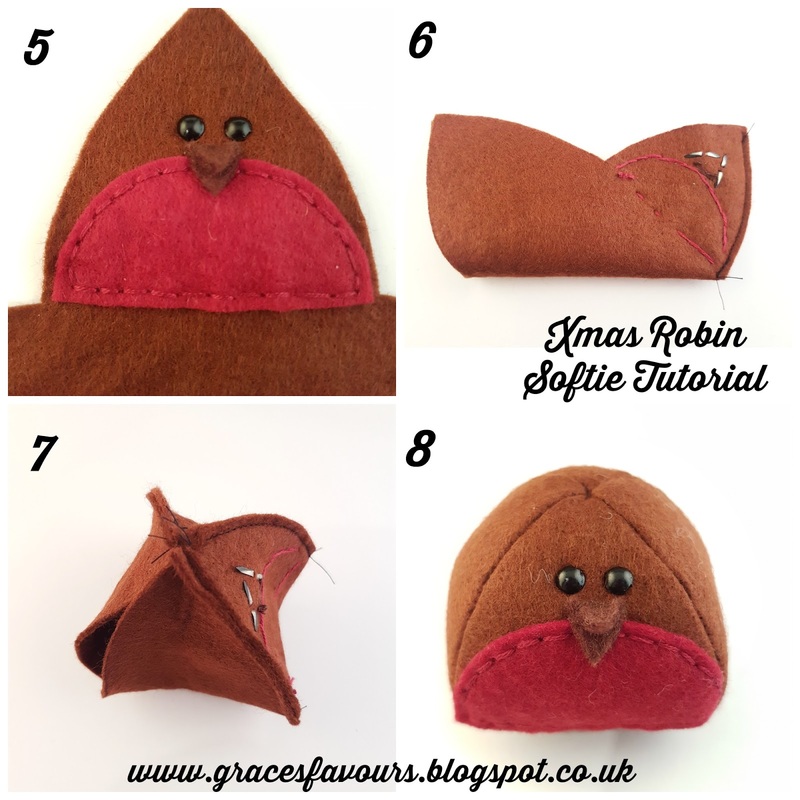 Fold it in half and attach just above the red breast with a couple of straight stitches at the top of the beak. 5. Mark with your pen where you want the two eyes to be and then push each brad through in turn, opening them carefully at the back, so they lay flat against the felt. 6. Starting with one side of the 'face' part, place the rights sides of the felt together and stitch all the way along the curved edge. You can either do this on a sewing machine or using back stitch if sewing by hand. 7. Repeat for the other side of the 'face' and along one other curved side, leaving one side completely open. 8. 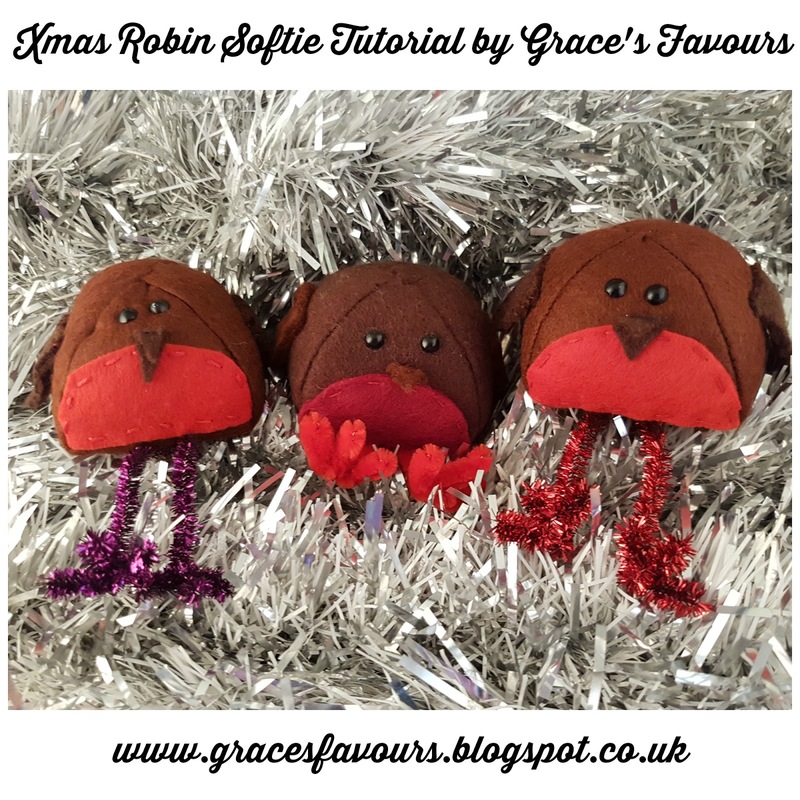 Turn your robin the right side out, stuff him full of toy stuffing and then ladder stitch the opening closed. If you aren't sure how to do ladder stitch, I have a video tutorial on my You Tube channel. 9. Time to add the wings. Each wing is 2 layers of dark brown felt, whip stitched together and then whip stitched to the sides of the robin. I've angled mine in the picture above, but in the first pic, the trio of robins, they're all on straight with the wing tips pointing down. You can choose whichever feels right to you. Try and line them up so they're both at the same height and angle though. Lastly you need to add the legs. I've used a single pipe cleaner and folded each end into a W shape for the claws at the end of the robins legs. 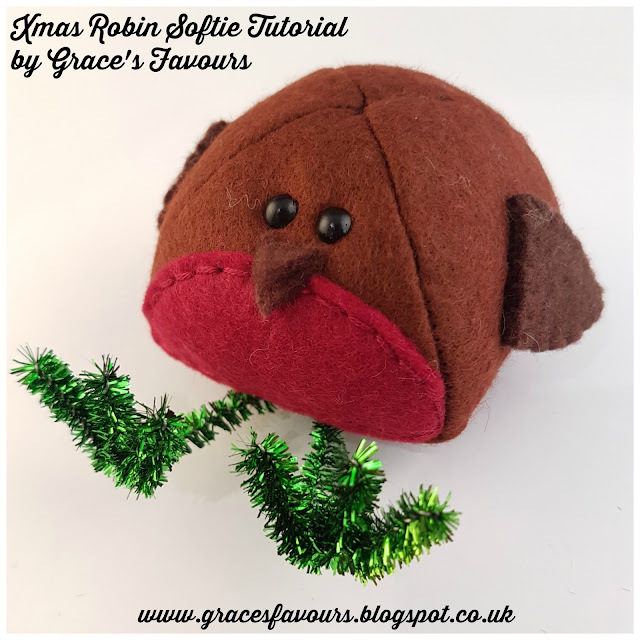 I've then just stitched the pipe cleaner in place under the robin, so you can swivel his legs to be underneath him, or sticking out like mine are so he's sitting down. You'll see from the top pic that some of the pipe cleaners are longer than others so some have much longer legs - you can always cut down your pipe cleaner if you feel it's too long. And you've done it - you have made your own Christmas Robin Softie! Well done! 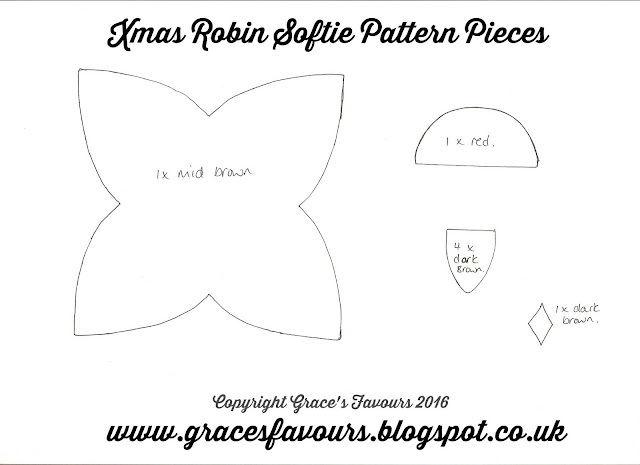 I hope you've enjoyed making yours and I'd love to see any pictures of your creations from my patterns. Felt Penny Rug Pattern for my 100th Blog Post!